Chatify is simple to use, yet includes all the features you need, to provide a live chat experience that delivers. Our chat box mirrors the messaging experience offered by the main smartphone messaging apps. Features like presence, read receipts, push notifications are leveraged to offer a familiar messaging experience to your customers. It's live chat that feels like WhatsApp. It's important that the chat box blends seamlessly with your site. The chat box is designed to be customised to match your brand. Colour settings, the chat icon, custom messages, etc. are all easily configured. No need to limit your live chats to text only. Images, docs and other file types are all supported. URLs that you post are automatically resolved. Go emoji! SMS, email and Push Notifications are supported. This means that your customers can choose the notification method that works best for them. Customers opting to get notified by SMS, on average, will be back on your site within 3 mins. Having to switch between apps to answer Facebook questions, Live Chats, Tweets is a real pain. With Chatify you can manage all your inbound support enquiries in one simple Dashboard. Add as many agents as you need, there's no limit on your team size. 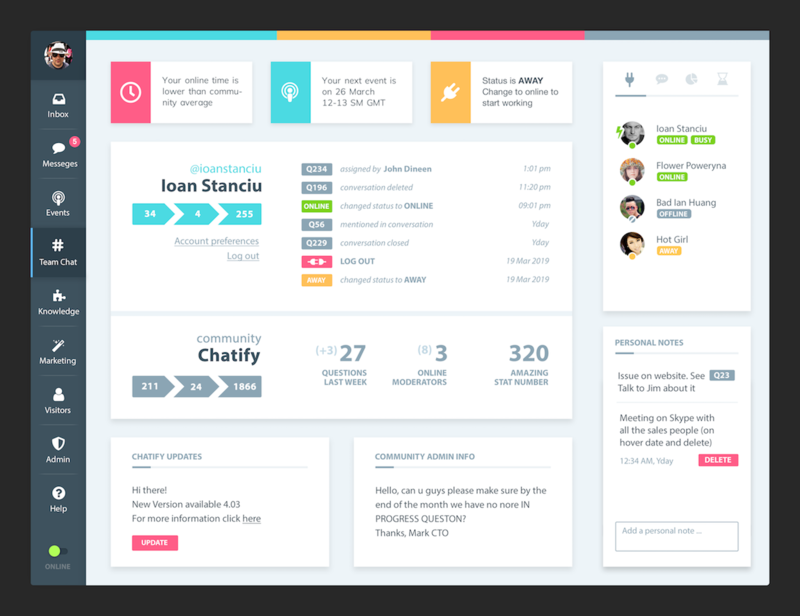 Chatify unifies your customer support channels and team in a single dashboard. Customer queries from your website, social media, in-store flow into the dashboard and with all your team in their too, it makes offering amazing customer support, so much easier. While your agents are chatting with customers, the Bot will automatically suggest relevant answers, helping each agent to work more efficiently. This feature makes supporting your customers from your smartphone genuinely viable. Tapping into the hive mind of expertise is one of the most powerful features of Chatify. The dashboard is designed to make it really easy to collaborate with colleagues while you support your customers. One feature, Chat Chat, allows you to start a chat (individual /or group) around a chat that you are having with a customer. Try it. You will love it. Designed to minimize the repetitive aspects of customer care, the Bot will auto-answer repetitive questions, leaving your team to focus on those queries where they can really add value. Setup Triggers based on user behaviour to proactively start chats with visitors. This will increase chat volume by 2-3x and drive more conversions. Easily deploy on WordPress / Magento. Push leads to Sales Force or MS Dynamix. Our integrations are designed to make Chatify play nicely with the business apps that you use. The EU General Data Protection Regulation, GDPR (2016/679) is a regulation in EU law on data protection and privacy for all individuals within the European Union. It became law at the end of May 2018. The short answer is that Chatify is GDPR compliant. The GDPR changes that we made are detailed below. "We first installed Zopim. We were excited by the opportunity to chat in real time with our online customers. However, after making the transition to Chatify, we immediately saw a higher conversion rate. With Zopim, the customer conversation moved to email. With Chatify, the customer conversation always happens on our site. This really helped our conversions." "Chatify has allowed our customers ask specific questions about plants and gardening products in real time and connects them to our qualified team. It's a really effective way for us to get closer to our customers."